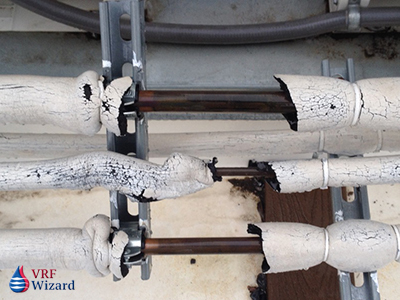 Refrigerant piping insulation has historically escaped the scrutiny that it has found itself under recently in some jurisdictions. What could possibly be such a big deal with plain old boring refrigerant piping insulation? 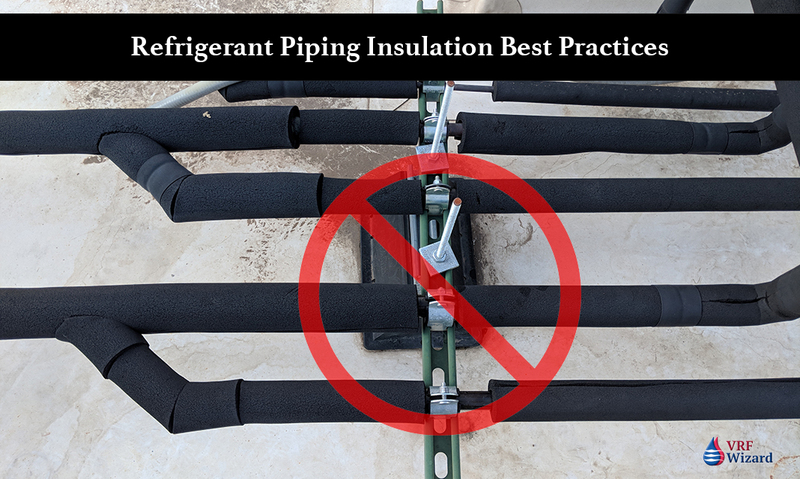 With energy codes getting stricter during each code cycle, and some large lawsuits related to refrigerant piping being improperly insulated, the need to get your insulation right is very important. Whether you’re an owner or manager of a building or the installing contractor, you need to know how to protect yourself from litigation and costly mistakes due to the improper application of the code covering your project. This is not to be considered legal advice, but is for the purposes of bringing to light the need to discuss with your contractor or city officials the proper application of the code covering insulation. Each VRF/VRV manufacture has a different insulation requirement based on their operating temperatures. 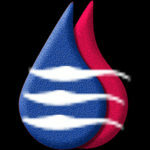 The biggest impact is for the High Pressure Vapor side of the requirements. Those VRF manufactures that have High Pressure Vapor operating temperature above 200 F would require 2-1/2” of insulation. I haven’t seen an installation with this thickness of insulation applied as mandated by the Building Energy Efficiency Standards. OK, so what’s the big deal with VRF Insulation? Using the 2016 Building Energy Efficiency Standards in California or the IECC as our example, we will cover how confusing it can be to get the correct insulation specified on your project. You should review your model energy code or building codes for the requirements in your jurisdiction to see how they compare with this discussion. Why do we Insulate Refrigerant Piping? Maintain system capacity & efficiency. Avoid heat gains or losses. 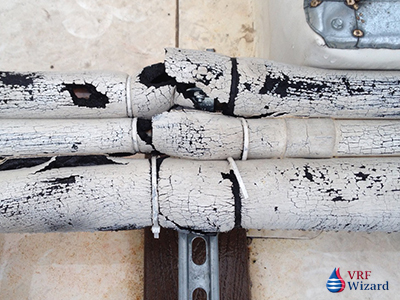 Prevent condensation on piping or insulation. Prevent mold growth from occurring on construction materials. Avoid property damage from condensation. VRF manufactures have specified in their engineering and installation manuals temperatures that any insulation used on their system must be rated for. Many of the VRF/VRV manufactures have listed temperatures well above the operating temperatures of your normal VRF system. This has created a lot of confusion about which materials are acceptable and at what thickness. 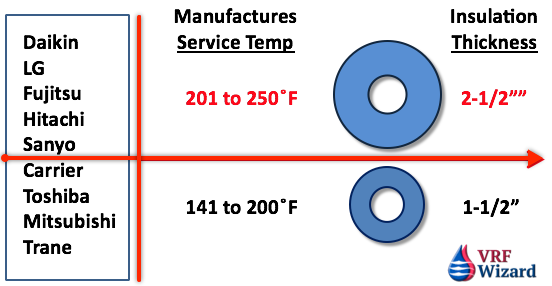 If we look at table 120.3-A above we see that the thickness requirement changes when we get over 200 F. Some of the VRF/VRV manufactures have stated temperatures above 200 F, which would require insulation that is 2-1/2” thick. When is the last time you installed a project with 2-1/2” thick insulation on refrigerant piping for a VRF system? My guess is never. All VRV/VRF manufacturers (that we’re aware of) require the insulation to withstand at least 248˚F. This 248˚F may be a manual reset, high-temperature safety limit on the high-pressure vapor (hot gas) line to protect the compressor or may be some other requirement from the manufacturer. This is what dictates the need for EPDM insulation (yes, fiberglass and others can meet this, but EPDM is the only insulation that is a closed cell continuous vapor barrier). This is not what dictates insulation thickness. If it was, all VRV/VRF manufacturer’s would require 2-1/2” on the high-pressure lines. Important note: this also applies to the need for EPDM on insulated coils (line-sets) going to the fan coils. To determine the VRF Refrigerant insulation requirements you will need to know several things to begin. Which VRF manufactures system that you are using. What are the operating temperatures for the various refrigerant pipes. The peak normal operating temperatures are what dictate insulation thickness in accordance with current state energy codes and/or ASHRAE 90.1. Important note: these temperatures also dictate the thicknesses needed on insulated coils (line-sets) going to the fan coils. Daikin states in their VRV III Engineering & Installation manual on page 59 that pipe insulation is to be rated to with stand a temperature of 248 F. See insert below. LG in their literature on page 37 calls for a temperature rating of 227 F.
You can see that knowing the VRF/VRV manufactures requirement for the temperature rating of the insulation can have an effect on the thickness of the insulation required for the same size of pipe in the system. One VRF manufacture may require 1-1/2” and another 2-1/2” of insulation for the high pressure vapor piping. It’s important that you check the VRF manufactures literature for the required temperature rating of the insulation, as each manufacture differs. Also, the VRF manufactures are dealing with contractors that have brought this issue to their attention, but as of this article have been slow to respond and make the appropriate corrections that limit the contractor or owners liability for differing from their published literature. 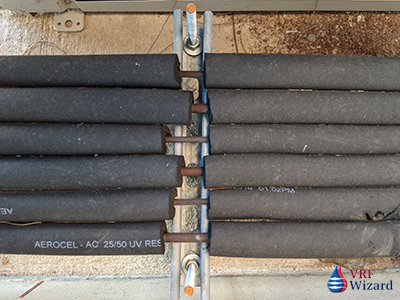 Most of us know that these thicknesses aren’t getting installed, as I’ve seen installations where the contractor just buys the standard pre-insulated line-set similar to these by Mueller. They have one thickness for both pipes, and don’t have one thick enough for most VRF manufactures requirements according to code. But somehow they never get flagged by inspectors for proper thickness or UV & weather protection compliance. You will find that the CMC & IECC codes along with ASHRAE standards require that insulation installed on the exterior of a building be protected from the sun’s UV rays and the weather. Unfortunately we have all seen this one slip by the inspector’s watchful eye. One just has to look at the unprotected insulation that has been installed for several years to see the signs of degradation. The insulation will start to crack and come apart at the joints and seams. Armacell recommends that you coat their exterior insulation with 2 coats of WB Finish and re-coat every 2-4 years. I don’t know about you but I haven’t seen a lot of that being done. How many owners or management companies do you know that re-coat their insulation every 2 to 4 years? See armacell’s technical information bulletin on the “Outdoor Protection of Insulation”. Here are a few examples of the improper application of insulation and what to avoid on your project. If the wrong insulation is installed or if the installation is done improperly, you could end up with water damage to the building, or if a leak goes un-noticed you might get mold growing somewhere. That word sends shivers down the spine of owners and contractors, as it awakens the hungry lawyers. The integrity of your insulation will need to be maintained for the life of the mechanical system, so getting it right from the start is important. Invest in the proper insulation and installation procedures to insure that you have thermal & vapor integrity for the life of your system. Be sure to use inserts, saddles and shields where appropriate. Never attach directly to the Insulation with a pipe clamp. obviously the owner or management company didn’t keep up with the continuous application of protective coating from the UV rays or the weather. Also the pipe clamps were incorrectly attached directly to the pipes. Not sure what happen here, but there isn’t much protection for the piping. 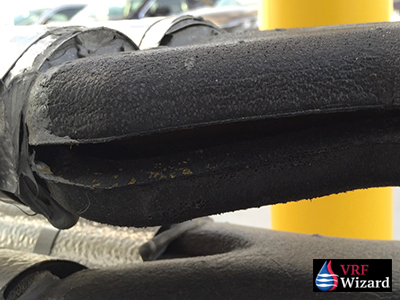 This installation didn’t even attach any portion of the piping or insulation to the unistrut support. The insulation is coming apart at the seams and joints due to poor application, and the improper insulation usage for an exterior application. This opens up another discussion, and that is the awareness of the requirements and enforcement by the regulatory officials. I have found that from city to city or from one jurisdiction to another there is no consistency in enforcement. With the constant changing energy requirements that are being pushed to meet energy goals established by legislation or local authorities, and the updating of codes every three years, there is a need to remain vigilant. 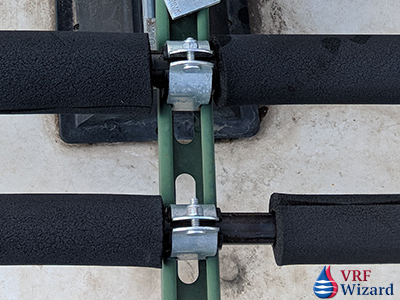 There are many improper installations that get approved and signed-off on which lack the proper installation methods, including the lack of UV & Weather protection for exterior refrigerant piping. In defense of the regulatory officials, how are they to keep up with the wavering message about the temperature ratings of the insulation required by the various VRF manufactures. Use pipe inserts at Hangers/Attachments points to avoid insulation compression. Don’t clamp directly onto piping. Use pipe saddles and shields to avoid crushing insulation. Be aware of pipe expansion and the possible movement of the saddle off the support. Fasten the saddle to the hanger and have a non-adhesive attachment to the pipe allowing it to move with the expansion. Make sure to use expansion loops where required. 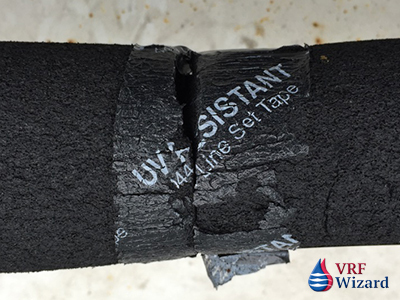 Make sure all seams and joints are tightly sealed with contact adhesive. Outdoor insulation should have UV and weather protection. Don’t compress insulation as this will cause a loss of thermal efficiency and or surface condensation on cold pipes where compression occurs. Leave space between insulated pipes. Always use the correct size of insulation. Make sure surface is clean, dry, unheated or uncooled. Adhere insulation directly to the pipe every 12 to 18 feet, at the beginning and ends of run. LEED projects require adhesives that have low to no VOC’s. Check the current version of LEED. The risk related to the improper application or selection of refrigerant piping insulation can be represented in a simple graph. Your risk increases as your quality of installation varies from the manufactures recommendation, and as you deviate from the code requirements. 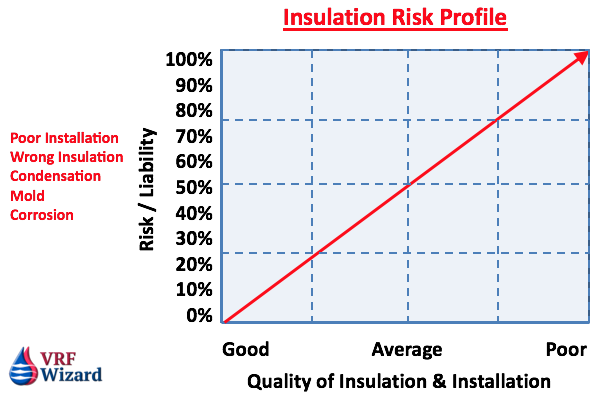 To mitigate the risk requires that you use proper insulation and have it installed according to the manufactures requirements. It’s imperative that the installing contractor comply with all applicable codes and standards and manufactures recommended installation practices. Owners and property managers need to be aware of the maintenance requirements of any exterior insulation and the signs of a poor installation. Inspectors have to be consistent in their application of the code and standards so that everyone is on the same playing field and the owner receives the protection that the insulation was designed to provide. VRV & VRF manufactures need to be consistent in their literature on the actual temperature requirements of the insulation for their systems. Installers need to be sure that they meet the VRF manufacturers recommended temperature rating for the insulation their installing. Its imperative that they install the correct insulation, with the correct thickness, and one that meets the temperature rating and exterior protection requirements.